Topstitching, which is thread stitched on the fabric that can be seen from the outside, can add the detail that distinguishes one pair of pants from another. Topstitching can have both a functional and decorative purpose. When it’s used functionally on a pair of pants, topstitching attaches pockets or a zipper (on a fly front) to the pants or strengthens a seam. When it’s used decoratively, topstitching creates a design on pockets or down a pant leg, adding visual interest to an otherwise plain stretch of fabric. Some pants and shorts have hardly any topstitching, whereas others are full of it. 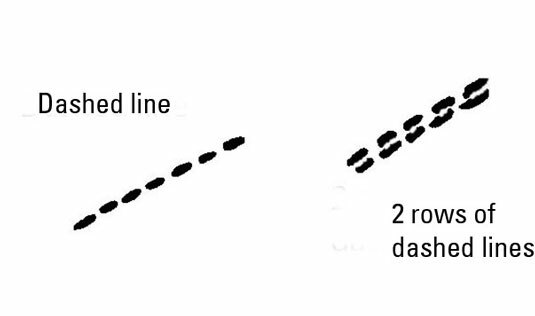 Dashed lines: These individual lines can be any length within reason. The dashes represent the thread used to create the topstitching. 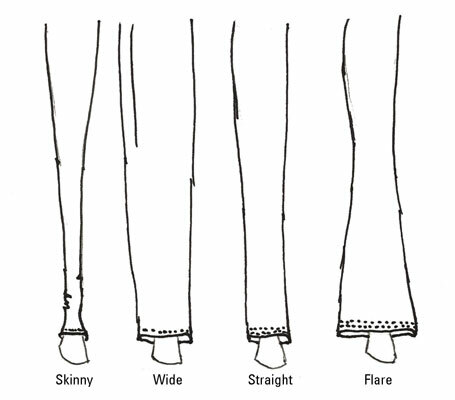 Multiple dashed lines: Pants, shorts, and especially jeans often have more than one row of topstitching. You may see topstitching in pairs or in triple rows down the sides or the inseam of the legs due to the type of seam used to construct that area. Play with the length of the dashed lines, the number of rows of lines you place next to each other, and the color of the dashes to add some pizzazz to your pants. If you’re drawing with colored pencils or markers, you can add your topstitching in a different color than the color you used to draw the outline of the pants. For example, if you draw a pair of black jeans, add gold or silver topstitching. You also find topstitching on garments other than pants — shoes, shirts, and coats all look a little nicer with topstitching detail.